Enjoy the mesmeric sights and sounds of Singapore from a totally distinct angle, with an unforgettable flight experience in Singapore Flyer, which is the biggest observation wheel in Asia. Singapore Flyer entry ticket from Rayna Tours enables you to take an enchanting ride in one of its 28 capsules, each with a capacity to hold 28 people at a time. At a height of 165 meters above the ground level, it offers stunning views of Singapore and its immensely famed attractions. You can even catch a glance of Malaysia and Indonesia during this enthralling 30-minute ride. To learn about the intriguing story of this engineering marvel, you’ll also get to enjoy its attractions like the Journey of Dreams. Grand Tour Singapore from Rayna Tours is an expertly handpicked package, offering a world of experiences to discover and relish. So, get set to enjoy seven nights in this iconic Southeast Asian vacation spot that comes with an electrifying mix of visually appealing modern architectures, intriguing monuments, awe-inspiring gardens and wildlife parks, and bustling ethnic quarters. Capture the authentic spirit of Singapore on an all-inclusive city sightseeing tour that heads you through the region’s enchanting landscapes. From the fabulous sights such as Merlion Park to the exceptionally contemporary Marina Bay and Orchard Road to the full-of-life Little India and Chinatown, this guided trip lets you absorb the contrasting charm of Singapore in a single day. For the most striking sightseeing experience from the top, take a rotation on the iconic Singapore Flyer and soak up the delightful views that are spread as far as 45 kilometers. 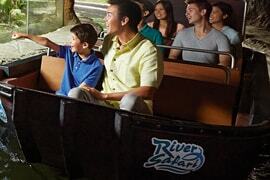 Continue your holidays with an unforgettable trip to River Safari, which mesmerizingly recreates the ecosystem of some of the world’s popular rivers including Amazon, Nile, Mississippi, and Yangtze. Besides attractions like Amazon River Quest boat ride, it is also home to a pair of adorable giant pandas. 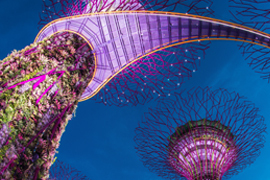 The most refreshing part of your holidays is a visit to Gardens by the Bay. With one-of-its-kind Supertree Grove and a delightful assortment of over 500,000 incredibly distinct and rare plants as well as flowers, this futuristic green space certainly lives up to its theme, ‘City within a Garden.’ You’ll further spend a full day at the ultimate leisure venue, Sentosa Island, where you’ll be spoilt for choices with its attractions and shows like cable car ride, Madame Tussauds Museum, 4D Adventureland, Wings of Time etc. 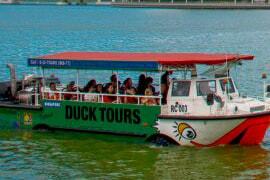 Besides an amazing amphibious adventure with Duck tour, you’ll also have ample time to experience the city at your relaxed pace. Booked this tour as a gift for my wife's 50th birthday! It was just me and my wife and we had an absolutely wonderful time. All the tours were great; but the best was the Singapore Flyer. 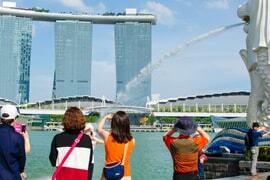 My wife also enjoyed the visit to Sentosa Island while I loved Gardens by the Bay. We also want to thank Rayna Tours for arranging such a good holiday. We returned home happy from our Singapore holiday! The Grand Tour of Singapore was amazing. My entire family including my wife, children and grandchildren had a great time. 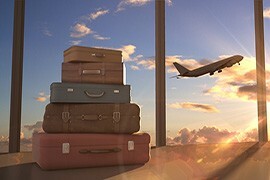 It was the first time we booked a holiday with Rayna Tours and were not very sure how it would go. But the trip was planned really well. While the adults enjoyed the city tour and Gardens by the Bay, the kids had a gala time at Sentosa Island and River Safari. I would definitely recommend this trip to anyone who is planning a family holiday. And to Rayna Tours, keep up the good work!